HGI Resources is a member of Redglaze Group. If you are not redirected to the Redglaze Group career page in the next 5 seconds, please click here to continue. Toyota is pleased to announce an enhancement to the Image USA II program. Together with CREE and other light manufacturers, and RGI Image — an HGI Resources Certified Provider — will provide lighting packages including design, product supply, inventory, and project management. Offering this enhanced program as part of the Image USA II renovation and ground-up branding initiative as well as dealers wishing to replace and upgrade their current Image USA II site and facility. At HGI, we have developed a lighting program that is very thorough in the analysis of the entire project, breaking it out by sections to be illuminated. Included are both exterior and interior areas, from the whole inventory car lot to service drive, showroom, new car delivery, and building lighting. For replacement projects, a comparison is available for each of these areas for current vs. forecasted lamp counts, annual energy usage, annual savings, and ROI. Additionally, a thoroughly researched package will accompany this offering to realize all of the tax benefits and incentives available for each specific dealer’s area, as they differ by geographic location. Recording these incentives for the dealer is part of the LED Lighting Program with HGI Resources. First and foremost, our commitment is to the dealer, to provide a successful program to you first, ensuring all entities work together towards successful design and implementation. Thus, HGI has designed a program that benefits only the dealer. The AOR, MEP, GC, EC and regional reps receive no real intrinsic value from this program. The LED Lighting Program is an enhancement to the program Toyota has made available to the dealer group. With a particular consideration to the Toyota Image, guidance and input from Toyota and Gensler have helped eliminate inconsistencies in the final lighting image. 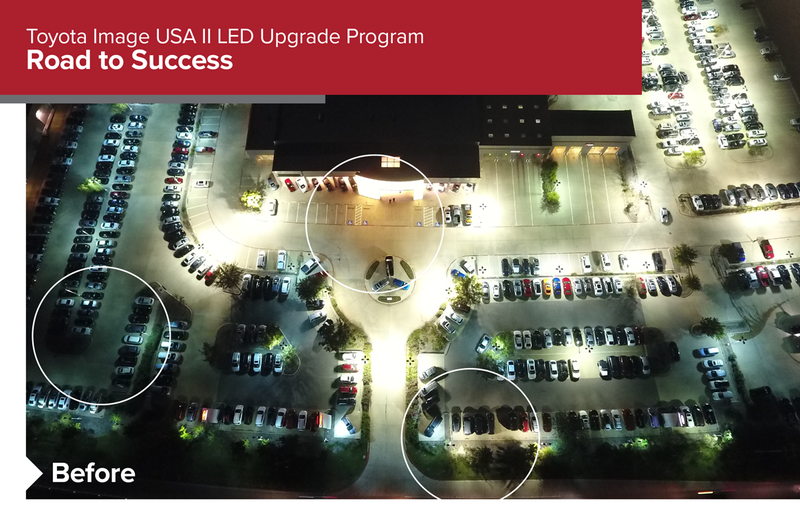 Addressed with this LED Lighting program, uniformity of light across all dealerships has become a focus of Toyota as part of the Image USA II program. 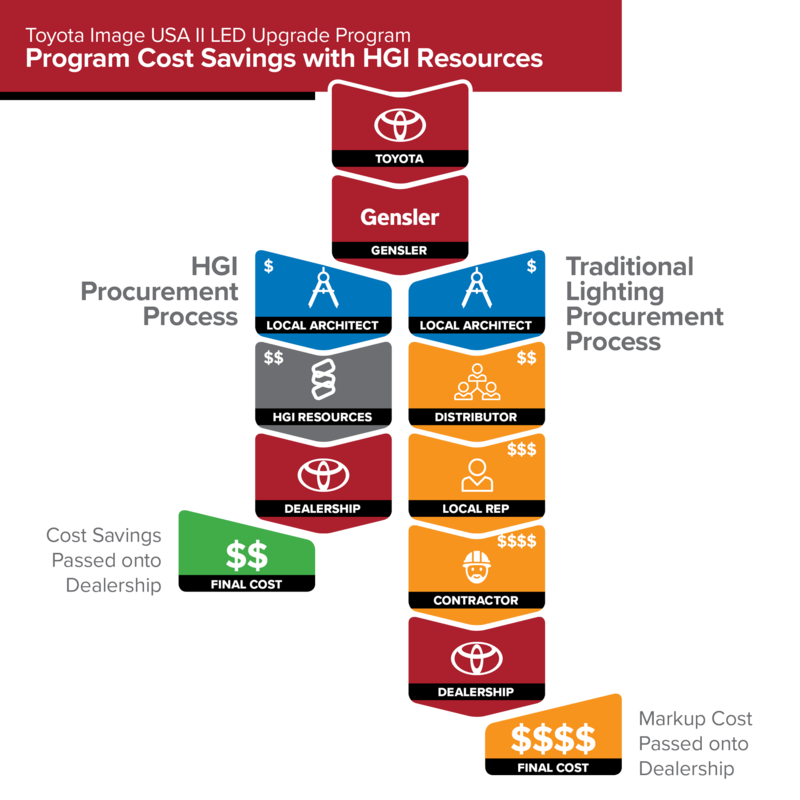 Because of the joint commitment from Toyota/Gensler/ and the Dealer to hold all other lighting proposals accountable for design, performance, warranty, and general quality, the pricing and value of the LED Lighting Program with HGI are transparent to the dealer. By establishing a national program price, we have eliminated dealer groups having to manage a myriad of local companies with a multitude of pricing structures, design inputs, and various distribution channels. This has both an impact on the individual dealership and larger national dealer groups, allowing the program to handle pricing for multiple dealerships the same throughout all 50 states. HGI partnered with Greenlamps—a natioanl distributor—to secure factory direct pricing, allowing the dealer to be isolated from the restrictions of territories and existing deals between lighting reps and distributors. All mid-level local, factory reps, distributors, and agents, along with all their associated markups have been eliminated. Utility & Federal Tax Incentives. To assist the dealer in recouping the costs associated with switching to LEDs, HGI and BambÚEnergy—energy services consultant—assist on the front, and back end of the project, with site audits before installation and rebate and tax incentive capture after installation. These are incentives for both the new build and LED upgrades. It is a complicated process, and in some instances, if submitted incorrectly, there isn’t a second chance to recoup the cost. It is more than just an estimate of the incentive based on published programs, but the ability to capture it on behalf of the dealer and in the case of the Federal programs (i.e. 179d), an engineered study can be commissioned. We manage the LED Lighting Program from manufacturer to install. With most lighting projects, once the product is delivered to the job site, a lighting company comes in to install. Manufacturer errors or incorrect shipments, damaged or otherwise inoperable fixtures become the responsibility of the installer/EC. With the LED Lighting Program, HGI maintains the responsibility to the dealer throughout the entire process from design to warranty claims. Through our experience with the Toyota Image USA II program, we are a trusted partner. The level of service provided with the Portal, ACM, Aluminum and Glass is now extended to LED Lighting. Just like the Image USA II program, we are your single source of contact, acting as the liaison between Gensler, you [the dealer and your AOR], MEP, Toyota Region, GC and EC. In collaboration with Greenlamps, HGI Resources has been able to negotiate special warranties for Toyota. This not only assures Toyota dealers that the initial product’s design quality in both form and function are of the highest level but adds an extended warranty, giving you the peace of mind throughout time to cover your investment. 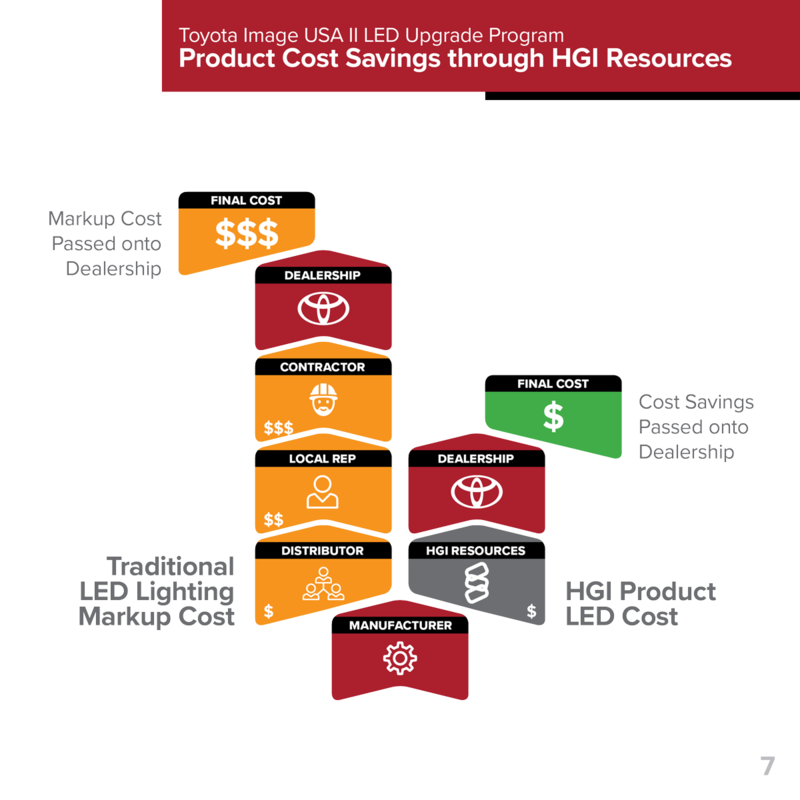 When you choose HGI Resources to manage your LED lighting project, you’ll discover added cost savings are passed directly to you. HGI will save you time, not having to work through distributors, local reps, and contractors, and will save you money. Not only does HGI Resources pass on program cost savings, but we also provide product cost savings. By partnering straight with LED manufacturers, there are less middle-man markups when the product is installed and billed to you. The situation. A new owner of an existing small town dealership takes an aggressive approach to updating his facilities to increase visibility and curb operational costs. The current site had undergone multiple ownership changes over the years and as a result had a myriad of lighting technologies throughout. 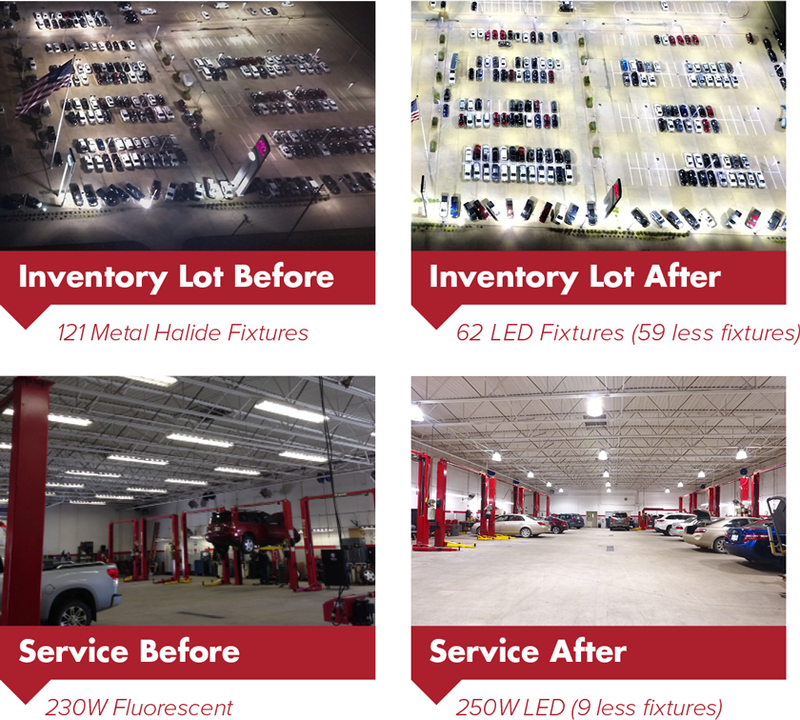 Our team conducted a thorough site assessment and energy analysis and with input from the dealer, set out to customize an LED lighting solution. The solution. 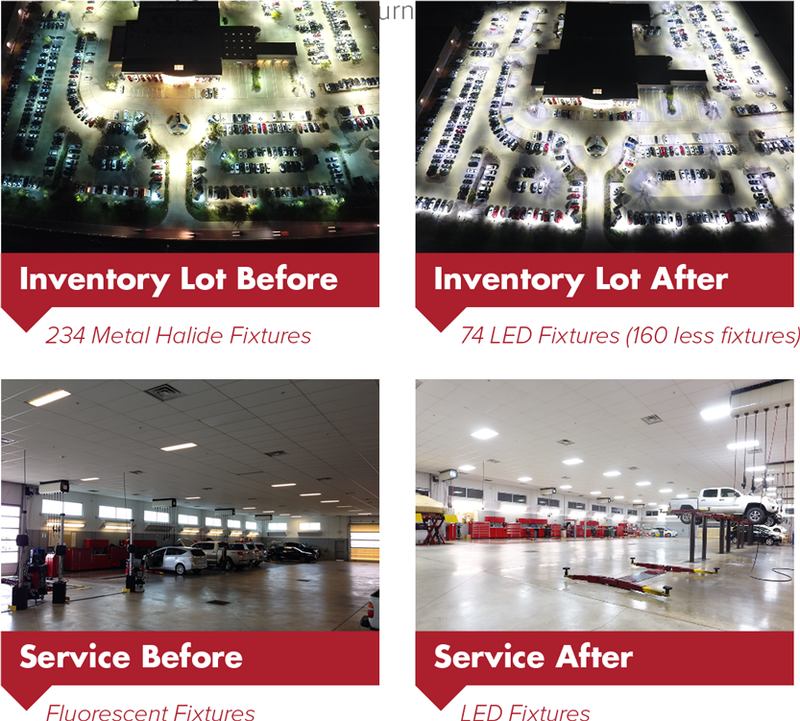 Working with our Toyota Image USA II – LED Program Partners, our team created a more uniform lighting package (with regards to color temperature, fixture types, and light output). For the site lighting, we were able to reduce the overall number of fixture heads from 143 to 77 (as a result of the dynamic performing optics of our premium manufacturer). The savings achieved across the interior, and exterior spaces amounted to a 62% reduction in energy and an annual savings of $73,728 (energy & maintenance combined). Additionally, the environmental impact is quite significant; 464 Tons of Carbon Dioxide and 5,361 kilograms of Sulfur Dioxide eliminated annually with 188 Tons of Coal not being burned to create electricity. The situation. Built in 2007 as the world’s first LEED Gold Certified Auto Dealership, the ownership has been on the forefront of sustainability and energy-efficiency and was eager to be an early adopter of the Toyota LED program. Our team’s challenge was to take this already energy-efficient facility and create an LED lighting package that would enhance the existing energy management solutions, while still providing a sound financial investment (both in additional energy savings and reduced maintenance costs). The lighting design enhances the customer experience both on the exterior and interior. As your experts, we are familiar with the variety of products and options available to ensure high quality, energy efficient, and cost effective solutions. Showroom. Consisting of lighting strategically arranged to provide general and focused illumination on vehicles and customer touch points. Customer Lounge. Utilizes a combination of pendant and recessed light fixtures to provide a more intimate look and feel in this area. Customer Restrooms. Designed to create a relaxing environment, combines recessed down lights and indirect lighting for the vanity, all fixtures using diffused glass lenses. New Vehicle Delivery. Highlighting the vehicle similar to the showroom with recessed lighting. Service Reception. Suspended fixtures with an open ceiling and maximized natural light through glass overhead vehicle doors and skylights where possible. Service Department and Tech Areas. Maximizing natural light through clerestory windows and skylines along with suspended fixtures with an open ceiling and wall mounted or suspended task lighting at the work bench. General Office/Sales/Parts/Support Areas. A combination of lay-in, recessed, surface mounted and in limited applications, track features, are utilized to provide general and accent lighting as needed. Exterior. 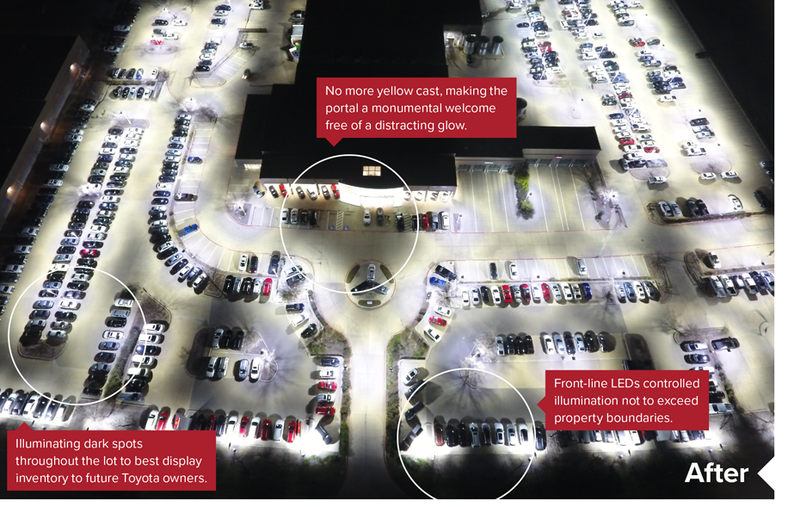 A lighting design is site-specific in coordination with the Portal, Signage, ACM, and overall building footprint; to emphasize vehicle presentation with a minimum distraction of curb appeal and exterior features of the main building. All LEDs will maximize uniformity to prevent hot spots or dark valleys between pole placement, all fixtures to be dark sky compliant, without lighting trespass or unwanted high angle light onto neighboring properties. Lighting Controls. Using wireless lighting management with smart scheduling, daylight control, motion control, and button control ensures the right amount of light, at the right place and at the right time to maximize the customer experience. Illumination. All areas of the dealership have a suggestion of lighting levels (foot candles, FC); color temperature and rendering index; and contrast ratios between graphics, displays, vehicles, as well as floors and walls. For specs, please review the Lighting Design Strategy provided by Gensler/Toyota.